How do I create an order on behalf of a customer? If they are a new customer you will need to create a profile for them. If they are a returning customer you can skip to the next set of instructions. Creating a new customer profile. Click Customers on the black bar at the top of the page. Click the blue Create New Customer button on the top left. 3. Enter their information in the boxes provided. 4. Click the green Save This Information button. Once they have a profile you are ready to create an order. Click Online Ordering on the black bar at the top of the page. Type the name of the customer into the box provided. Find the appropriate customer and click the grey fork and knife symbol on the far right. 4. 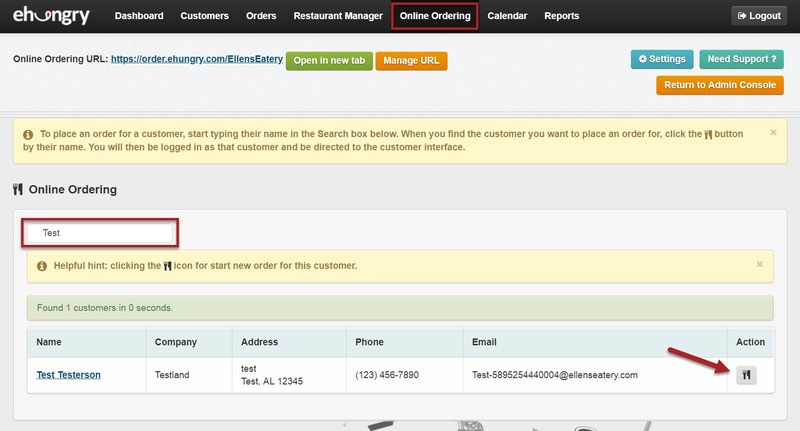 You will be redirected to your eHungry page and can select the desired items on behalf of your customer. 5. When you have everything click on Checkout on the far right. 6. Here you can select what type of order it is (Pick-up, Dine-in, or Delivery), choose a time and date, add a tip, and select a preferred payment method. 8. Click the Place Your Order! button and you are done! Need help? Don't hesitate to reach out!